Distribution: New South Wales, Victoria and southern Queensland, usually in wet or swampy conditions. Callistemon citrinus is the most widely cultivated member of the genus both in Australia and overseas (where it is sometimes known by its older name of C.lanceolatus). There is ongoing controversy about whether Melaleuca or Callistemon should be used for the bottlebrush species - see box below). Some herbaria have now adopted the name Melaleuca citrina for this species, however, this reclassification has not been adopted in the Australian Plant Census (which is accepted by ANPSA as the authority on Australian Plant nomenclature). 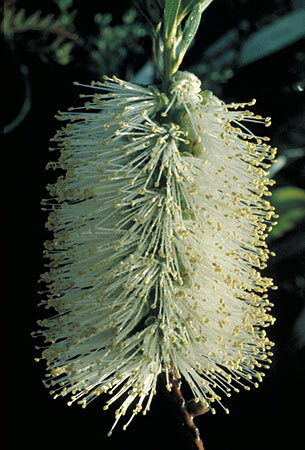 Note also that the name Melaleuca citrina had been previously used for a Western Australian species - that plant is now called Melaleuca lutea. The species has been responsible for may of the cultivars that are seen in gardens, sometimes as hybrids with other Callistemon species. Most of these cultivars have arisen as chance seedlings rather than by deliberate hybridisation. Some of the better known cultivars of C.citrinus are "Mauve Mist" (mauve), "Burgundy" (purple-red), "White Anzac", "Endeavour" (red) and "Reeves Pink" (pink). In general, C.citrinus is a medium shrub reaching about 2m by 2m. Some forms may vary from the typical size (eg. C."White Anzac" is generally a shrub to 1m). It is a hardy plant under a wide range of conditions. Like most Callistemons, C.citrinus (and its various forms) are adaptable to a wide range of soils and climate and may be pruned severely if necessary. Many Callistemons can tolerate less than perfect drainage but usually perform best in gardens with reasonable drainage and regular availability of water. Callistemons respond to well to annual fertilising after flowering and are not as sensitive as some other Australian plants to phosphorus. A paper by Lyn Craven of the Australian National Herbarium (Novon 16 468-475; December 2006 "New Combinations in Melaleuca for Australian Species of Callistemon (Myrtaceae)") argues that the differences between the genera Callistemon and Melaleuca are insufficient to warrant them being retained separately and that they should be combined. As Melaleuca has precedence, adoption of Craven's work would transfer all species of Callistemon into Melaleuca. Some state herbaria have adopted this change but, at this stage, the re-classification has not been taken up in the Australian Plant Census, which ANPSA recognises as the authority on plant nomenclature. 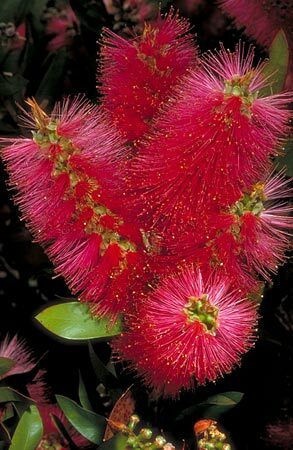 For this reason we have retained Callistemon as a separate genus but the corresponding names under Melaleuca will also be mentioned where appropriate.